KANSAS CITY, Mo. 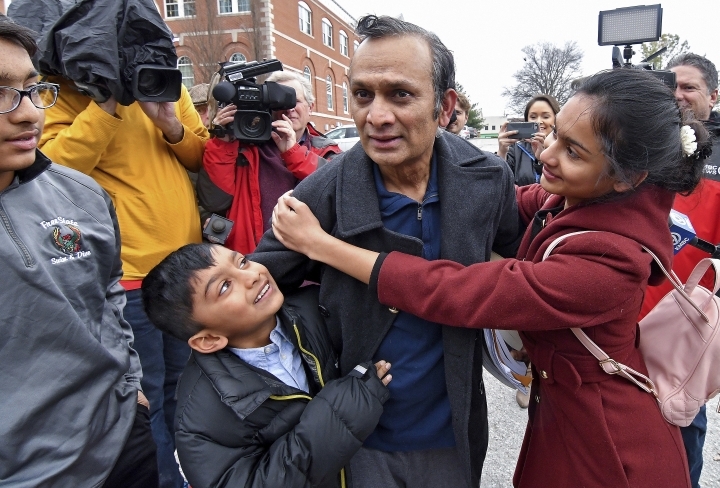 — A Kansas man who is fighting deportation to his native Bangladesh for overstaying his visa was given a reprieve until at least 2022 after an immigration judge agreed to consider whether he could legally stay in the U.S.
Syed Jamal, of Lawrence, had the first hearing of his recently reopened case Tuesday in Immigration Court in Kansas City, Missouri. Judge Glen Baker said he would review whether Jamal qualified for certain forms of deportation relief and set the next hearing for April 27, 2022, The Lawrence Journal-World reported . Jamal and his supporters began fighting his deportation in January when immigration agents arrested him at his Lawrence home for twice overstaying his visa. He was on a plane back to Bangladesh when a court ordered that he be returned to the U.S. He was removed from the plane in Hawaii . Jamal is applying for two ways to remain in the U.S., one via a cancellation of removal and the other through asylum. Immigrants who have been living in the U.S. for 10 years with no disqualifying convictions can qualify for cancellation of removal. Asylum applies to refugees who can demonstrate they have been persecuted or fear they will be persecuted in their native land. Baker said Tuesday he needed to review whether Jamal is eligible for the cancellation of removal. The 2022 hearing will proceed either way, because Jamal can apply for asylum. Jamal's hearing was combined with that of his wife, Angela Zaynub Chowdhury, who is also from Bangladesh and was seeking the same forms of relief. One factor in Jamal's case is whether a voluntary departure order that an immigration judge previously issued him is valid. If it is found to be valid, Jamal would not be eligible for a cancellation of removal. Jamal's attorney, Michael Sharma-Crawford, argued the order was not valid because Jamal was not correctly notified by immigration regulations. Attorney Patricia Lacey, representing the Department of Homeland Security, argued Jamal had been properly advised regarding the order, making the notice valid. Several of Jamal's friends and supporters attended the hearing, as did their three school-age children, all of whom are U.S. citizens. "I am very optimistic that when it comes, it will be a positive decision," Jamal said. "That's what I'm hoping, and we'll do our best to convince the court." Jamal, who has worked as an adjunct professor and researcher at Kansas City-area colleges, entered the U.S. legally in 1987 to attend the University of Kansas but twice overstayed his visa. He was ordered deported in 2011 but had been allowed to stay in the U.S. and check in regularly with immigration authorities. After he was returned to the U.S., Jamal was jailed in Platte County, Missouri, until March, when he was freed to return to Lawrence. Jamal said that until the 2022 court date, he will stay in Lawrence and continue teaching, doing research and caring for his children.